The life of a castle lord is no walk in the park. 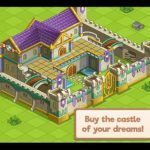 MY.COM’s new mobile game Hustle Castle shows you just that by placing you in charge of your very own medieval castle. This game will have you manage your own subjects, train your people, expand your fortress, and even fend off a few rivals. There are hundreds of campaign missions for you to complete. You will also need to develop each of your villagers by having them learn new skills and giving them equipment. If you are feeling a bit competitive, you can send your men out to loot and pillage the castles of other players. Of course, you would have to be prepared to defend your own castle as well. There is a lot to do, and our collection of Hustle Castle tips, tricks and cheats is here to teach you everything you need to know! Equipment makes a lot of difference in this game. Good gear will give your villagers both stat boosts and traits. They might even get bonus stat boosts such as additional attack power from an armor. Aside from fighting ability, a villager can also get resource benefits from equipment. An example of this is the Financial Analyst’s spectacles. These glasses can increase earning capabilities of your villager. There are other types of equipment benefits. Make sure you find the ones that are best suited for each villager’s tasks. There are several things for you to consider during an attack. It is not just about battle power rating. One thing you should think about is the type of weapon your characters will use. Even though a sword and a bow can have the same attack power, bows get to deal damage earlier due to its range advantage. Think about how you will overcome the sword’s range limitation should the enemy have archers. You should also consider the number of villagers you will be sending into battle. Keep in mind that two strong fighters can easily take out five weak ones. Although upgrading the throne room is important, you don’t really need to rush its levels. In fact, you should go ahead and max out everything else in the castle before upgrading your throne room. A lot of new stuff will be unlocked when you upgrade your throne room. You can’t really upgrade everything at once so it’s better if you don’t commit resources to your throne room until you actually need to. It is good to wait until you have run out of other things to do in your current castle before working on your throne room again. As for upgrading other rooms, you should prioritize the Barracks and Training Ground since military power is very important in the game. After that, you should work on the Dining Hall and Treasury. Finally, you can finish off with the Cellar and Vault. If you are not having any food and coin issues, feel free to work on the Cellar and Vault first. Gems can be bought using real money since it is the premium currency of the game. 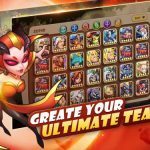 If you don’t feel like shelling out the cash, however, there are a few ways for you to get free gems. One way is to open chests. These give out gems randomly, so just open as many as you can. Another way to get free gems is through achievements. Tap on the crown icon to see the list of achievements. You can collect your gem rewards from this screen as well as check out what else you need to complete. Fighters who stay in the training room continue to build up their fighter stat. Make sure you always leave one fighter in the training room even when you send out people for raids. That fighter will keep powering up until you are ready to send him to the barracks. When you finally upgrade your throne room and have space in your barracks, you will automatically have one super-powered fighter ready for battle. Upgrading a room takes time. If you want to minimize the construction time, make sure you fill up the room with villagers before you upgrade. The villagers who are staying in that room will help boost the construction speed. This trick applies to all rooms, so always get as many villagers as possible into the rooms you want to improve. The babies are spawned from the living room, and their stats and rarity depend on their parents. If you have two 1-star parents, they will always have 1-star children. That is why you should develop a system for spawning children. First, put any couple in the living room and have them mate until you fill up your resident slots. After that, get a couple of high-star men on mating duty in the living room. Once you have the right men for mating, rotate all your women in the living room until they all get pregnant. Send in your highest rated ladies first. Keep in mind that a female villager can get pregnant once per day, but a male villager can mate as many times as you want. Once the females give birth, keep all the high-star babies that spawn then slowly banish the low-star residents until they are all replaced. If you don’t know how to banish a villager, don’t worry because it is easy, and there are no consequences. Just go to the villager’s screen by tapping on them. Once there, tap on the three-bar icon on the upper right corner of the screen. There you will see the Banish from the Castle option. Tap on it to banish your villager. Resources can be stolen by attackers in Hustle Castle, so make sure you use as much as you can before logging off for the day. It is better for you to waste resources on making random upgrades than give them away to marauding players. Also, avoid opening chests unless you need them. Chests contain various resources, but they cannot be stolen. They make good emergency supplies in case you get attacked and have all your resources raided. Having high rating can be dangerous. You will be more likely to get attacked if your rating is high. Try to lower your rating on purpose in order to stay under the radar of more powerful players. To do this, just go ahead and perform a revenge attack on everyone who has attacked you. Instead of seriously attacking them, however, you should send out just one weak soldier. When you lose the battle, your rating will go down. You can do the same when you attack other players. It will still cost you a few resources, but it is better to take that small loss in order to protect the rest of your treasures. The game gives bonuses to friends who play together. You can send and receive gifts from your in-game friends. If you don’t have a lot of friends playing the game, however, there is still a way. Just link another Facebook account to the game. You can create one or just use the account of another family member. Once you have a second account, just befriend yourself and start sending gifts to each other. You will also receive a reward after sending ten gifts, so make sure you send as often as you can. Actually, there are numerous benefits of joining a clan in Hustle Castle. These benefits can only be enjoyed, however, if your clan is active. That is why you should spend time clan-hopping until you find an active one. Make sure you also pull your weight and help out other clan members whenever you can. A lot of clans require a certain level of participation from their members, and kick inactive ones on a regular basis. 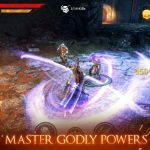 There are several possible combinations for your party, but it is important to consider which units to include. Try to keep your party balanced regardless of the number of slots. If you have a 3-slot party, include two tanks and an archer so that you have two goons protecting your damager. You can also go for one tank, one healer, and one archer. Having a healer makes your tank beefier, so you will survive with just one tank. If you have a 4-slot party, you can go with one tank, one healer, one reviver, and one archer. You can switch in another tank if you don’t have revivers. Lastly, a 5-slot party can have one tank, one healer, two revivers, and one archer. Again, you can switch in more tanks if you don’t have revivers. Take note that most suggested compositions revolve around staying alive rather than dealing a lot of damage. Your one archer can take out all the enemies if your tanks can survive long enough, compared to sending a lot of archers who will just get slaughtered as soon as an enemy reaches them. The game starts you off with a good number of free gems. That doesn’t mean, though, that you should go on an early shopping spree. 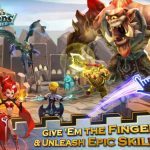 You may think it is good to have a head start in the game, but what you need to consider is that the start is easy enough even without gems. You will eventually reach a point when upgrades will become prohibitively expensive. Instead of waiting for days to generate the amount of gold you need, you can overcome this by spending a few gems. Adding new rooms means gaining access to new features. That is why you should add new rooms as soon as possible. The three rooms you should prioritize are the fighter training room, the hospital, and the magic workshop. The fighter training room is important for strengthening your characters. The hospital, on the other hand, is good for grinding because you will regenerate health faster. Lastly, the magic workshop allows you to create powerful spells. This is important because it will often happen that you need just a little more in order to win. Using the right spell in these situations can easily tip the scales in your favor. The main story is all about chasing after the princess in order to keep her from becoming the villain’s bride. You will go through hundreds of levels before you finally rescue her. That does not mean, however, that you should just focus on moving forward in the campaign quests. There is a benefit to going back to previously completed levels. Invasions will occur, and monsters will start occupying older levels. Going back and defeating them will get you a nice reward. You will get an even better reward if you somehow manage to put a stop to the invasion within the allotted time. Make sure you do this in order to get all the rewards. On the upper right corner of the screen is a face icon. This indicates the happiness levels of your villagers. If your people are happy, you will get a 5% bonus in earnings. This can go up to 20% if you have a premium account. The good news is that it is easy to keep your residents happy. Just log into the game, wait for them to say something as indicated by speech bubbles over their heads. Just tap on these speech bubbles in order to make your resident happy. It’s that simple. Of course, winning battles also make your villagers happy, but it’s not always a sure thing. Your treasury allows you to earn a significant amount of money on a regular basis. That is why you should max it out as much as you can. Make sure you also fill it up with competent residents. Just tap on your villager and check under Classes. It will show you their proficiency as treasurers. If you can, try to fill up your treasury with only high-level treasurers. You should also equip your treasurers with the best possible equipment for their class. Your in-game income depends a lot on this! One way for you to earn a lot of money in Hustle Castle is through PVP and campaign battles. The campaign battles naturally reward you with a lot of money if you continuously complete them. As for the PVP, you will need a strong army in order to loot as much as you can from other players. Of course, this opens you up to possible retaliation, so make sure you invest in a good defense as well. There is no point in raiding a lot of resources if you end up losing them all after another player attacks. If you are willing to shell out real money, the premium pass is a great buy. Aside from giving you a 20% increase in all income, it will also give you better drops after each mission, more resources earned from PVP raids, and less loot lost when defeated. There are other benefits for having a premium pass, so invest in it if you can. Argonius is one of the bosses in the game. He is so frustratingly difficult to defeat that he deserves his own space in our guide. Make sure you only send troops that are at least level 30. Otherwise, you will just be sending villagers to their doom. There are a few things you should keep in mind when assembling a party. First, he is a melee unit that deals physical damage. He also prefers to hit warriors with the least amount of health. Lastly, he will occasionally reflect damage he receives. The last one is the primary reason why he is one of the most annoying bosses in the game. When building your attacking party for the Abode of Argonius, keep in mind that you cannot take a tanker with high damage because he will end up killing himself. The best way to deal with this boss is to take the turtle route. Just outlast him since he does not have a way to heal himself. Your ideal team would then be one unarmed tanker, two mages with heal, and one mage with revive. This party will take a very long time to take down Argonius since you will have minimal damage. You will have your tank deal low damage to make sure you can survive in case the damage is reflected. Your two healers will heal any damage received, and the reviver is there just in case someone dies in the process. Keep whittling away at the boss and he will eventually fall. Since Arnonius is a physical unit, there is a way to defeat him using magic. This tactic, however, requires a very specific set of high-level mages. It is better to stick with the party suggested above since the unit requirements are fairly accessible. It will take a lot more time to train up the right mages for battling Argonius. Since he is just one of the many bosses, it’s hardly worth it to spend time training a team for him. You are now fully equipped to take on the world of Hustle Castle! Things can get rough on your journey, but if you follow everything on our ultimate strategy guide, you will definitely succeed!